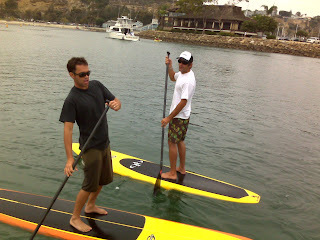 Stand Up Paddle Surfing: Coming Soon: Paddleboards- they're everywhere! Coming Soon: Paddleboards- they're everywhere! Got the chance to look at a few more stand up boards and will be adding more photos and information about them soon. I was able to check out and ride the new C4 Waterman 10'0 (below) and am working on getting some photos of some nice looking paddleboards out of Seal Beach (shaped by Tim Stamps in white shirt). Check back! Is that the guitarist from Bearded Youth I see on the other SUB? Coming Up: Heading North, New Boards, New Spots! Check out this ride: I call it the LowRider. In the water: C4 Waterman 10'0"
Coming soon: A dog's life at La Ventana.